We aim to forge long term relationships with our clients by providing industry leading talent, service, strategies and marketing technology. Since 2004, we’ve created winning digital marketing campaigns for household names like Peugeot, Dunelm Mill, Endsleigh and Halfords Autocentres. During this time we’ve expanded to become a leading independent UK Search & Digital Performance Agency. We aim to work with both market leading brands and ambitious companies that want to grow their business through digital and online channels. Clients love our work because we’re straightforward, and straight-talking. We don’t force clients into making long commitments because the quality of our work speaks for itself. We focus on digital performance and talk daily with our clients about KPI targets, forecasting and return on investment. Everything we do is measured and attributed to the activity and spend on your campaigns. Visit our client page which shows some of the companies we work with. Our expertise sets us apart – we’re a proud to employ innovative individuals that are authorities in the respective fields. Our team provides digital performance and marketing services including Paid Media Management, Organic Search, Content Marketing, Social Media, Conversion Optimisation and Email Marketing. Our web development team provide ecommerce and CMS web design and development services, specialising in Magento and Enterprise-level WordPress builds. We employ friendly, professional and confident people that want to play an important role in the growth of ClickThrough. Our employees are genuine, positive and passionate about digital marketing. The key to our culture is being inquisitive and creative about ideas and pro-active about personal growth, driving improvement and getting things done. We work with & have endorsements from our world leading digital marketing, ad network and technology partners. We’re a Premier Google Partner. We employ Google-qualified experts to deliver the highest possible service levels. We’re a Kenshoo Enterprise Pro Agency. We were awarded Best Mid-Sized SEO Agency 2018 by BrightEdge - the world leading SEO and content performance marketing platform. 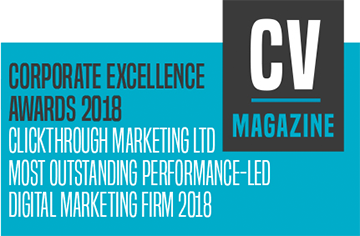 We were awarded Most Outstanding Performance-Led Digital Marketing Firm 2018 by Corporate Excellence Awards. We’re a HubSpot partner and won the award for best newcomer for inbound marketing impact in 2016. We’re a RAR Recommended Agency. ClickThrough also has a track record for building its own technology, including BidCops - the Adwords Auditing Tool used by over 2,000 companies and agencies worldwide. Our blend of technology, track record, people, expertise and methodologies are what set ClickThrough apart from other agencies.